You’re driving along when you hear on the radio there’s a new cholesterol lowering drug that can actually reverse blockages in your coronary arteries. You make the radio louder to get the full story, but the announcer has already gone on to talk about the weather. Or you’re reading the paper and learn that medication errors happen so often in some hospitals, patients risk being harmed every day they occupy a hospital bed. But you never learn what can be done. Well, now there is a solution to this vexing information problem — and we would like to offer you a free sample. I’m delighted to report, there is a remarkable health letter published by the distinguished faculty at the Duke University Medical Center which explains in clear, easy-to-understand English which new medical insights in the news today can dramatically improve the health of you and your family. It’s called HEALTHNEWS, and the Publishers would like to offer you a risk-free subscription so you can see for yourself. Now more than ever, finding and utilizing proper health care is a matter of negotiation. Patients are presented with choices and they are becoming active participants in making what they hope to be the right decisions to ensure a healthy outcome. Duke Medicine HEALTHNEWS is a partner that will guide you through your health care options. …new cures, new drugs, and new studies that can have a significant impact on the health of you and your loved ones — IMMEDIATELY! An amazing (and delicious!) diet that slashes your risk for heart disease by 33%. How Botox (the wrinkle-smoothing drug) can zap migraines as well as ease the urinary woes of men with prostate cancer. Which is better for multi-vessel heart disease — bypass or angioplasty? Why a cerebral emboli may hold the key to treatment and prevention for vascular dementia and Alzheimer’s. What three new studies give hope for diabetes treatment? Which diet may lower your risk for Alzheimer’s? New ways to increase bone density with calcium and vitamin D.
How 50% of patients with pancreatic cancer saw tumor shrinkage after 12 weeks using a new combo treatment approach. Can Omega-3 Fatty Acids prevent sudden cardiac death? A new study in the American Journal of Cardiology compared atrisk men who took fish oil supplements and a group that took a placebo. The result? Omega-3 fatty acids significantly decreased resting heart rate, thereby lowering the risk factor for sudden cardiac death. Let’s face it. Every day medicine is advancing so rapidly, it’s almost impossible for you and me (much less our individual physicians) to keep up with the latest breakthroughs that may dramatically improve the quality of our lives, or our loved ones. Making Health Decisions Without the Full Story Can Be Dangerous! 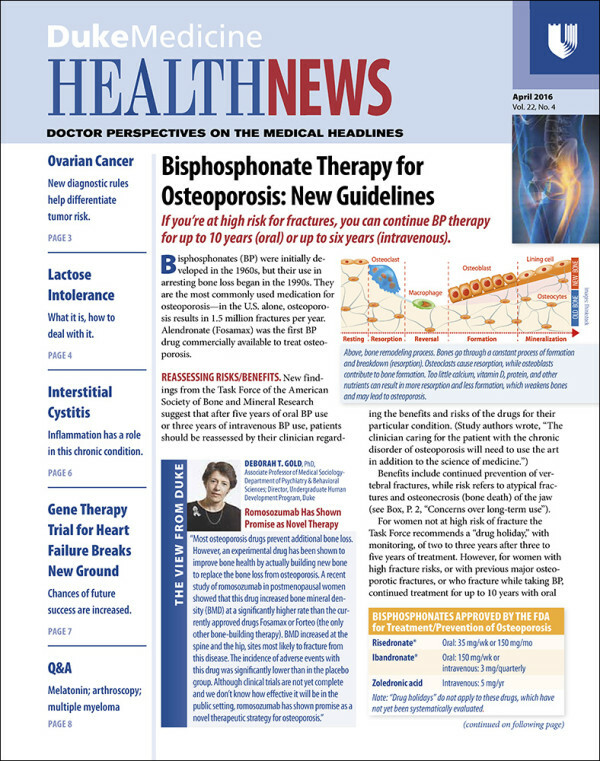 Learn about the new cures, new drugs and new studies from the distinguished doctors at Duke University Medical Center in Health News! That’s each monthly issue of HEALTHNEWS will arrive on your doorstep like a welcomed friend. Because on page after page, a team of Duke’s most brilliant doctors and researchers pore over the latest studies… look at the current data… cut through the media hype… and translate the breaking medical news into easy-to-apply solutions you can use now. Is there a new therapy that could potentially double breast cancer survival rates? Yes! Patients treated early with a Tamoxifen-chemotherapy combination found a dramatic increase in survival rates. In HEALTHNEWS you get all the facts. Are statin drugs as beneficial as we have been lead to believe? Their cholesterol-lowering powers are showing more promise every day. In addition to helping ward off heart attacks, according to a new study in The Lancet, statin drugs are indispensable for helping people with diabetes. Can you really reduce your risk of getting cancer by eating the right foods? Yes. Five new studies explain which foods can help prevent what cancers and why. In a recent issue of HEALTHNEWS, we explained how you can fight cancer at the grocery store. Frankly, before HEALTHNEWS, if you wanted to know more about a popular over-the-counter cold medicine that is 17 times more likely to give you a stroke, or how certain acne creams can reverse sun-damaged skin, you had to subscribe to hundreds of medical journals yourself at a considerable expense. Is there a risk to becoming permanently blind from using Viagra? When should you start adding high fiber to your diet, and how much? Can gargling when you have a cold cut your rate of infection in half? Do you know how to control your blood pressure without drugs? Does your doctor know which new medicines to prescribe to protect your heart and kidneys if you have diabetes? When is it safe to delay prostate surgery? You should take aprotinin before heart surgery, right? WRONG! A new study reveals that it may do more harm than good, doubling the rate of kidney failure and higher rates of stroke. Women should take soy isoflavones in pill form to get valuable protein without increasing their carbohydrate consumption, right? WRONG! Soy has many positive and healthful attributes, but concentrated isoflavones in pill form can increase a woman’s risk of breast cancer. You’ll discover which diet — carbohydrate, protein, or unsaturated fat — is most likely to lower your cardiac risk best. How to cut your risk for colon cancer by 25%. An amazing new treatment for aging eyes. Is it possible to find relief from Irritable Bowel Syndrome using hypnosis? Stem Cells may one day cure Alzheimer’s… replace damaged genes… fight organ rejection… and even help people with spinal cord injuries, right? YES! While research is still in its infancy, some results — like treatments for lupus and a rare childhood brain disease — are already visible and dramatic. By now you probably get the idea. Because each page of HEALTHNEWS reads quickly and easily, you’ll be able to scan what is vital and relevant to you and your family. You’ll learn if organic food is really healthier. How vitamin E may help the elderly ward off colds. Why radiation after breast cancer surgery is unnecessary for older women. Where you’re hospitalized for heart failure significantly impacts the care you receive. You’ll find out about the new shingles vaccine that can offer relief to millions. New ways to boost brittle bones. New advances in treating lymphatic cancer. …CLICK HERE! Simply complete the form and your subscription will begin immediately. YOUR RISK-FREE GUARANTEE. If you’re dissatisfied with HEALTHNEWS for any reason, just drop us a note, email or even call and we’ll be happy to refund you your entire subscription payment, no questions asked.